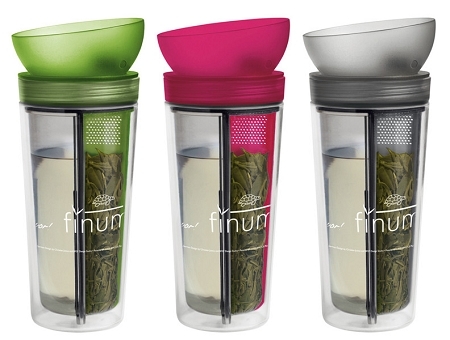 A rocking innovation: finum's® multifunctional TRAVELER ZITA™, is a double-wall tumbler for cold and hot drinks. It includes the world-wide patented Tea Control™ Kit (as well as further pending patents), avoiding the poor tea and over packaged tea bags. By simply screwing the lid on the tumbler the tea leaves are trapped, thereby controlling the brewing of the tea and keeping its taste uncompromised. TRAVELER ZITA™´s exceptional and appealing look is largely owed to its lid, which resembles a tea cup. This durable and elegant tumbler is made from BpA-free Tritan™ (FDA approved material) by Eastman. Its brand new Corkmec™ closes the spout with a silicone cork. As a result, tea leaves can be re-brewed just by adding hot water! Delicious tea is now made to everyone's personal taste, and the waste of over packaged tea bags is avoided.